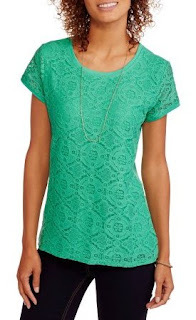 Faded Glory Women's Short Sleeve Lace Front T-Shirt - Only $5.50 (reg. $9.88) + FREE Store Pickup! Right now, you can get one of these really cute tops at Walmart.com for Only $5.50 (reg. $9.88) + FREE Store Pickup! (Availability of item and pickup depends on area). 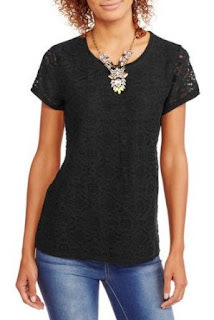 Add a bit of lace to your life with the elegant and versatile Faded Glory Women's Lace Front T-Shirt. Made of a soft and comfortable polyester blend, this lightweight top will keep you feeling breezy on hot summer days! There's a large, semi-sheer lace panel on the front that provides a dash of elegance, while the solid lining underneath keeps you comfortable. The short sleeves and wide scoop neckline won't restrict your movement, and they let you show off some skin. This lace top is available in assorted colors and can be paired beautifully with anything from jeans to leggings to skirts, and is a great addition to your casual wardrobe. 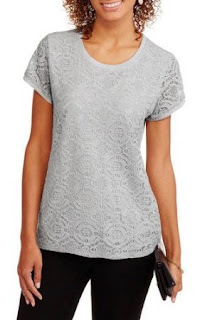 Add a bit of lace to your life with the elegant and versatile Faded Glory Women's Lace Front T-Shirt. Made of a soft and comfortable polyester blend, this lightweight top will keep you feeling breezy on hot summer days! There's a large, semi-sheer lace panel on the front that provides a dash of elegance, while the solid lining underneath keeps you comfortable. The short sleeves and wide scoop neckline won't restrict your movement, and they let you show off some skin. This lace top is available in assorted colors and can be paired beautifully with anything from jeans to leggings to skirts, and is a great addition to your casual wardrobe.